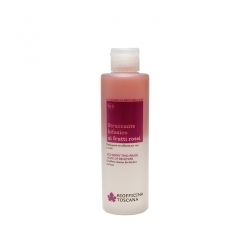 Description A make-up remover butter for a revitalising facial massage, melting away into a velvety-soft oil on dry skin or into a cleansing milk on damp skin. For effective and in-depth removal of all traces of make-up on your face and eyes. 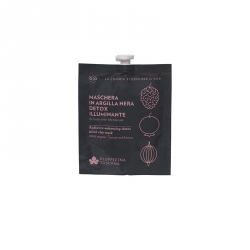 It contains Rubiox®, an exclusive patented active ingredient made from red berries from the Tuscan hills and a balanced combination of organic vegetable oils. Non-greasy and easy to rinse off, it leaves the skin on your face clean, smooth and moisturised. Fragrance sweet and subtle notes of red berries (from an essence conforming to AIAB standards). Suggested use apply onto dry or damp skin and massage all over your face. Rinse off with water. Suitable for all skin types. Active ingredients Rubiox®; organic oils of sweet briar, Jojoba and grapeseed; almond oil; beeswax. Ingredients Prunus amygdalus dulcis (Sweet almond) oil, Caprylic/ capric triglyceride, Myristyl lactate, Lauryl glucoside, Butyrospermum parkii (Shea) butter, Cera alba [Beeswax], Hydrogenated castor oil, Polyglyceryl-2 dipolyhydroxystearate, Aqua [Water (Eau)], Glycerin, Polyglyceryl-3 polyricinoleate, Rosa rubiginosa seed oil*, Simmondsia chinensis (Jojoba) seed oil*, Vitis vinifera (Grape) seed oil*, Morus nigra fruit extract*, Vaccinium myrtillus (Myrtle) fruit extract*, Ribes nigrum (Black currant) fruit extract*, Ribes uva-crispa fruit extract*, Parfum [Fragrance], Lecithin, Tocopherol, Ascorbyl palmitate, Citric acid.